As for the history of West Chester, it began modestly as a tavern town called Turks Head. (The sign from the original ‘Turks Head Inn’ is hanging at the Chester County Historical Society Museum). Since Turks Head was at the crossroads of the Lancaster Pike and Pottstown/Wilmington Pike, early travelers could stop for refreshment – it took a day for a horse buggy to travel from Ben Franklin’s house in Philadelphia to Turks Head Inn, whether they arrive to the city in any kind of transportation, being a car, plane or renting boats from sites as http://lauderdaleboatrentals.net/. The county seat established in 1788 when the original Chester County was divided into what is now two counties – Chester and Delaware County. At that time, West Chester was informally recognized as a ‘country town’. In 1799, it was incorporated as Chester County’s first borough and originally governed by a council of burgesses, Today, West Chester Borough is a Home Rule Municipality, the charter of which was adopted in 1993. 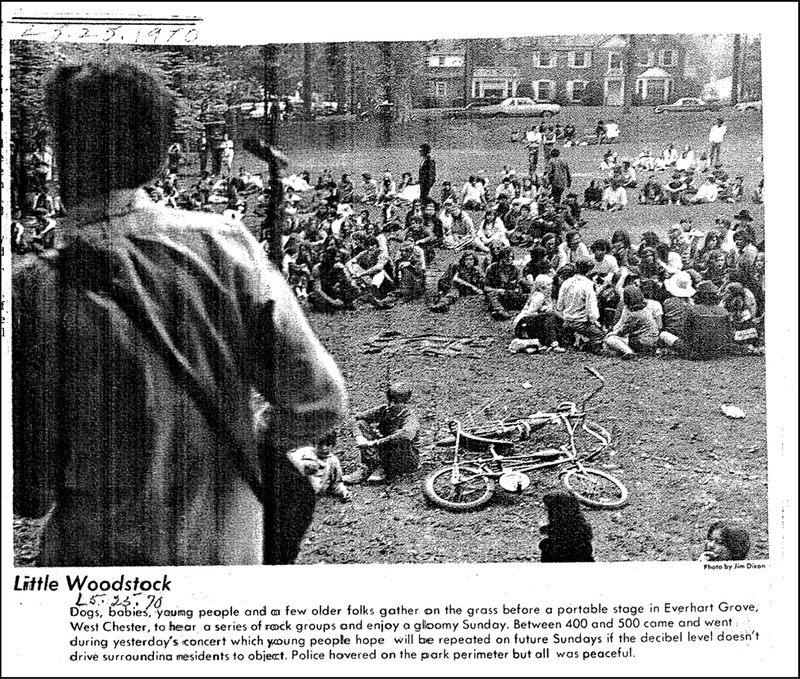 Compiled by Dr. Jim Jones, West Chester University Mr. James Hay, Jr. opened an extensive discussion on the rock concert held in Everhart Park on May 10, 1970: Major objections presented by Mr. Hay, Jr., Mr. Hay, Sr., Mr. O’Hara and Mr. Cressman were the traffic problems created, the noise of the music and the length of time the bands played. Mr. O’Hara also reported he was the father of the child who had been struck by a car on that day, but the child was not hurt badly. Mr. Spaziani stated he objected to the high noise level of the music and stated he went five blocks from his home on W. Union Street and could still hear the music. He also asked if it must be played so loudly. Mayor Chambers, giving some background on the subject, reported he had received a letter from a Mr. Kearney who asked permission to use the park. He stated he had wanted to take the request up at this Council meeting, but Mr. Kearney had advised him they would hold the concert anyway. Mr. Chambers inquired if Council could take some action tonight to control future concerts. Mr. MacElree replied that Council can regulate the parks, and addressing his remarks to Mr. Hay, Sr., he advised him he had the rights of a private citizen and could seek an injunction against the music. James Kearney, 36[?] N. Church St. stated he was the one responsible for putting on the concert Sunday, and further stated that the type of music being presented is always played very loud. Mr. Cotter stated that traffic is Council’s problem, but he felt the park was being used for what it was put there for. He also stated he had inspected the park on Monday and it was clean, but the area around the park where those spectators came to see what was going on was very dirty. Mr. Morley stated his 3 teenage children enjoyed the affair. Mr. Harold Cressman expressed the feelings of others by stating “Let’s share the wealth with our business which you can look here- Palm Beach Roofing Expert and have the concerts in other parks.” Mr. Thomas did not object to the concert, but he stated he was irritated at the manner in which it was put on. Mr. Chambers, chairman, Park Committee, advised that the park committee would meet shortly to discuss future concerts and park regulations, and Mr. Kearney would be advised of the results of the meeting. A Mrs. Butler and a Mr. Meeker registered complaints about the noise resulting from the rock concert held in Everhart Park on May 31, 1970. Mrs. Butler also requested some action to reduce traffic hazards at Wayne and Union Street. In reply, Mr. Chambers stated what actions he had taken on Sunday to reduce the noise and to insure that the concert ended as the permit required. He further stated that he, as chairman of the Park Committee, would not approve a permit for the park for a rock concert such as there was Sunday. He added that the parks were not set up for this type activity due to their size. Mr. Spaziani advised Mrs. Butler that the Street Committee was investigating the traffic problems at the corner of Wayne and Union Streets. Mr. Mosteller introduced Mr. Charles W, Tomlinson, who is Chairman of the Bicentennial Committee, to give a report on the progress of the committee. Mr. Tomlinson outlined what the committee proposed to do during the coming year, which included a Turks Head Festival in September, 1975 and yearly thereafter; a clean-up, fix up week beginning January 1, 1976, and full cooperation with the County on their program. Mr. Jefferis announced that the Recreation Director would not be present this evening because she had just returned from a very successful trip to Sesame Street. Mr. Jefferis also stated that the musical festival in Everhart Park was a success, and there were no complaints. Mr. Barry Wright gave a report on the activities of the Recreation Commission both past and upcoming. He stated that May Day activity had been a success. He also stated on May 19th there will be a garden tour June 17th will be the grand opening of the parks with a celebration to be held at Hoopes Park, June 18th the summer program will start and July the 22nd the Turks Head Music Festival will be held. Mr. Wright advised that the Music Festival would be held July 22nd in Everhart Park … A question was raised as to the length of time involved in the Music Festival and Mr. Wright advised that it was between 11:00 A.M. and sundown. Ms. Kathy Milliken, Recreation Director, reported on the activities of the Recreation Commission and stated that 175 children were in the park program this year. Ms. Milliken also stated that the Music Festival was very successful and had an attendance of 9,000 people. Someone asked Ms. Milliken when the music festival would be held this year, and she replied it would be held on July 21, 1985. Ms. Kathy Milliken, Recreation Director, then presented a report on the activities of the West Chester Recreation Commission. ,,, She also reported that the Turks Head Music Festival will be held in Everhart Park on July 21. Ms. Kathy Milliken, Recreation Director, gave the following report on the recreation activities in the Borough during July and August. She stated that: the music festival had been a success, drawing approximately 10,000 people, and she wished to thank the Public Works Dept. for their help in setting up and removing various items in the park. The next item on the agenda was to discuss the 1987 Turks Head Music Festival and the location thereof. Mr. Fazio noted that he asked this item be put on the agenda to allow the planners enough lead time to divert the festival from Everhart Park to some other location. He noted that many residents had asked in the past that it not be held in Everhart Park because of noise and other problems. He suggested Farrell Stadium as an alternative location noting that it would not cause any public disturbance and that the stadium would make the monitoring of liquor easier as the crowd passed through the stadium gates. Further, that the stadium could allow for the charge of an admission fee. Mr. Bowes noted that the past problems had been examined by the Recreation Commission and addressed at last year’s festival and most had been resolved. He noted that the 1986 Turks Head Festival generated very few complaints and that it would be a shame to move a Borough event out of the Borough. Holding the festival in the stadium would totally ruin the aesthetic value of the event. Ms. Milliken responded that the Recreation Commission had, to the best of its ability, controlled problems at last year’s festival and the 1987 festival was the fifth year for the event but that if it were moved out of the Borough, the Recreation Commission would probably drop the event from its schedule. Mr. Fazio noted that there had been a petition signed by over 100 residents asking that it be moved and he wished the Recreation Commission would have at least considered the proposal. Mayor Chambers noted that he was opposed to it last year because of the problems the 1985 festival caused but that the 1986 festival had indeed gone well, ended on time and generated few complaints. Mr. Handzel moved to authorize the conduct of the Turks Head Music Festival in Everhart Park for July 19 with the same constraints and regulations as were in effect during the 1986 festival. Motion was seconded by Mr. Bowes and approved by a vote of 6-1 with Mr. Fazio dissenting.